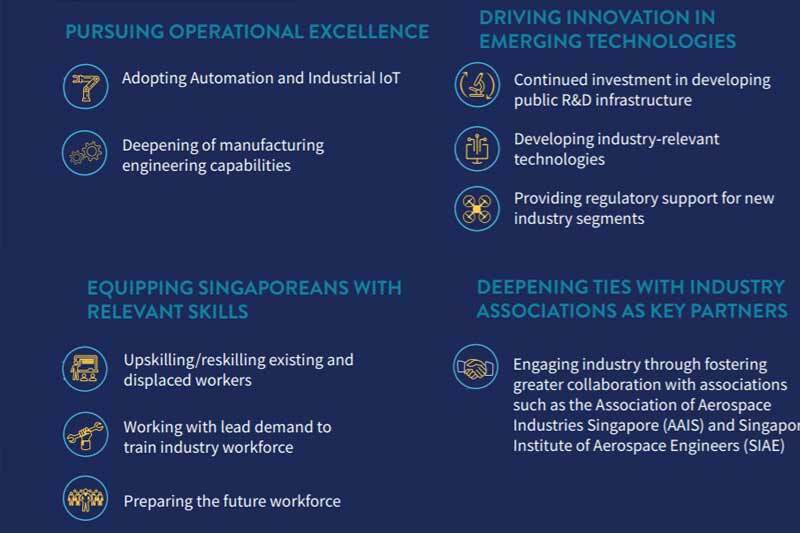 value-added of S$4 billion and introduce 1,000 new jobs by 2020.
locals, and the majority are in high-skilled job roles. across the value chain in manufacturing, MRO and aftermarket industry segments. data scientists and additive manufacturing (3D printing) design engineers. the aviation industry on both sides. industry, the government also aims to deepen ties with industry associations. to upgrade existing lines to manufacture next-generation aircraft components. team to support and lead continuous improvement. supporting the innovation pillar in the Aerospace ITM. automation, avionics and wireless communications. can be brought to commercialisation in the coming years. systems (UAS) in Singapore, responding to the rapid developments in this area. unions, and education and training institutions, was also launched today. training programmes for each job role. Analysis, and Data Mining Techniques for Manufacturing Excellence. Officers and Aerospace Executives have been launched. including those from the NTUC Aerospace and Aviation Cluster. a pipeline of future-ready talent. services and Lifestyle. Most of the ITMs have been released.